The largest domestic bluenose fisheries occur in BNS 1 and 2. Historically, catches in BNS 2 were predominately taken in the target alfonsino and bluenose trawl fisheries, but have been primarily taken by target bottom longline fishing in recent years. There is a target line fishery for bluenose in the Bay of Plenty and off Northland (BNS 1). The first fully quantitative stock assessment modelling for bluenose was carried out in 2011. Following the 2011 stock assessment a rebuild plan was put in place with phased reductions to the total allowable commercial catch (TACCs) for bluenose stocks. In 2011, TACCs were reduced in BNS 1, BNS 2, and BNS 3. In 2012, TACCs were further reduced for all bluenose stocks. A third phase of TACC reductions was introduced in the 2016-17 fishing year, with the overall TACC reduced to 900 t.
TACCs were first established for bluenose upon introduction to the Quota Management System (QMS) in 1986–87. Catch performance against the TACC has varied, with the combined TACC being undercaught by an average 9% to 20% from 1987 to 2008. Bluenose is also targeted by recreational fishers around deep offshore reefs using line fishing methods. The risk assessment covers nearly 90% of bluenose caught in New Zealand. 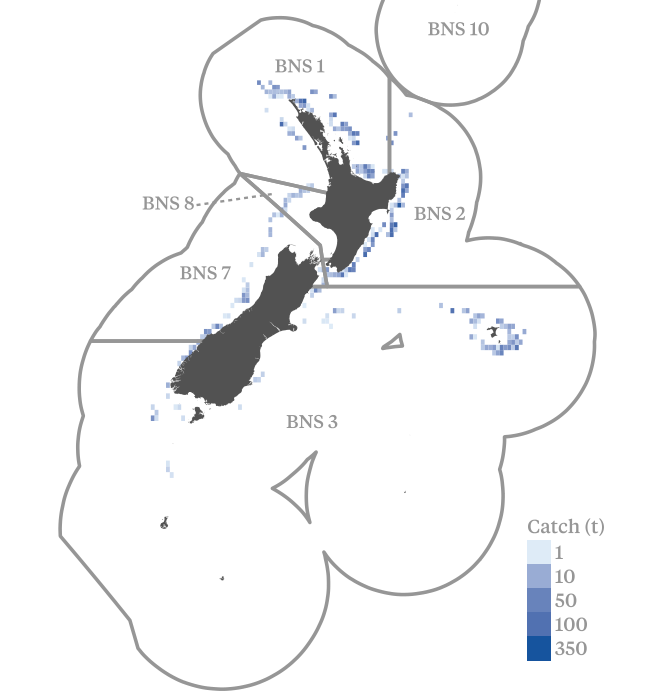 The Ministry for Primary Industries reports that bluenose stock boundaries are unknown, but similarity in trends in catch and catch per unit effort (CPUE) across fisheries occurring in each of the five New Zealand bluenose Quota Management Areas suggests the possibility that there may be a single bluenose stock across all these areas, or of some close relationship between stocks in these areas. The most recent estimates of stock size in 2016 ranged from 17–27% of the unfished biomass. Biomass was estimated to have declined continuously from the 1980s to 2011 and then to have either leveled off or increased slightly. Biomass has been below the default 40% unfished biomass target since around 2000. Although the ‘true’ level of natural mortality is not known with certainty, it is not clear from the most recent model results that there is at least 70% probability of the stock being above 20% of the unfished biomass. On this basis, the medium risk scoring guidepost is not met. Nevertheless, for at least plausible estimates of mortality the stock is estimated to be above 20% of the unfished biomass. The harvest strategy has the key elements needed to ensure that exploitation is reduced as the point of recruitment impairment is approached; a sound and measurable index of relative biomass, a suite of performance measures based on these estimates of relative biomass, and a total catch adjustable annually. While there is no formal mathematical harvest control rule (HCR) for this stock, there is a process in place to identify, examine and respond to issues of declines in the bluenose stock, and a suite of available tools to implement reductions in exploitation if needed. Action taken to reduce the TACCs in response to the 2011 stock assessment provides evidence that the management system is willing to reduce exploitation as the point of recruitment impairment is approached. Limited publicly available information has been found on catch composition for the bluenose longline or trawl fisheries, albeit more detailed information may be available through MPI observer coverage. Qualitative and quantitative information is insufficient to estimate the impact of the fishery on at least some main other species with respect to status. The Ministry for Primary Industries notes that other commercially important species taken when longlining for bluenose are ling, hapuku and bass. There are no estimates of current biomass are available for hapuka/bass and t is not known if current catches or the TACCs are sustainable or at levels that will allow these stocks to move towards a size that will support the maximum sustainable yield. Alfonsino forms the dominant bycatch in the BNS 2 and BNS 3 trawl fisheries targeting bluenose. It is not known if the recent catch levels or the current TACCs are sustainable. The main potential endangered, threatened and protected (ETP) species interactions in the bluenose fishery are with seabirds and protected corals. Notwithstanding limited observer coverage in the bottom longline sector, some quantitative information is available which has been able to support risk assessments for key ETP species (e.g. seabirds) and analysis of likely interactions (e.g. corals). The Ministry's protected species bycatch database contains good records and analysis of fisheries interactions by gear, vessel size, and ETP bird, mammal and reptile species across New Zealand commercial fisheries. The extent to which the bluenose bottom longline sector is contributing to overall black petrel mortalities is uncertain given the very low rate of observer coverage (0-2% between 2002-03 and 2014-15). While the measures in place (offal management, streamer lines, night setting/line weighting) could be considered likely to work, recent modelling indicates the median risk to black petrel across New Zealand fisheries remains above its sustainability targets (albeit with considerable uncertainty). The bluenose targeted trawl fishery’s contribution to overall interactions with seabirds is likely to be very small. It is probably highly unlikely that bluenose targeted trawl fisheries will hinder recovery of protected corals as well. While objectives broadly consistent with Components 1 and 2 are specified in the Fisheries Act and Fisheries 2030, and are therefore implicit in the fishery specific management system, it is not clear that explicit short and long-term objectives for bluenose fisheries are in place at this stage. Depending on the estimate of natural mortality used, the bluenose stock is estimated to range from 17–27%. Following the 2011 stock assessment, a rebuilding plan was introduced which involved stepped reductions in the TACC. Stock projections at the current TACC of 900 t indicate the stock should grow, although the rate of growth depends on estimates of stock recruitment, steepness and natural mortality used. The stock status of main bycatch species, including hapuku (longline) and alfonsino (trawl), is unknown. The bluenose bottom longline fishery has a bycatch of black petrels. Recent preliminary risk modelling indicates the median risk ratio for black petrels across all New Zealand commercial fisheries is higher than its population sustainability threshold. Target species - Improving: All stock projections point to an increase in the stock in coming years. Work is underway on a management procedure to guide the rebuilding plan. Bycatch and ecosystems (BNS1_BLL) - Uncertain: Estimates of risk to seabird species have been continuously refined over recent years and have generally resulted in lower estimates of overall risk, including to the highest risk species taken in the bluenose bottom longline fishery, black petrel. Additional independent observations of seabird interactions will better inform risk assessments. Bycatch and ecosystems (BNS2_Trawl & BNS3_Trawl) - Stable: No major changes are expected to bycatch and ecosystem risk scoring.